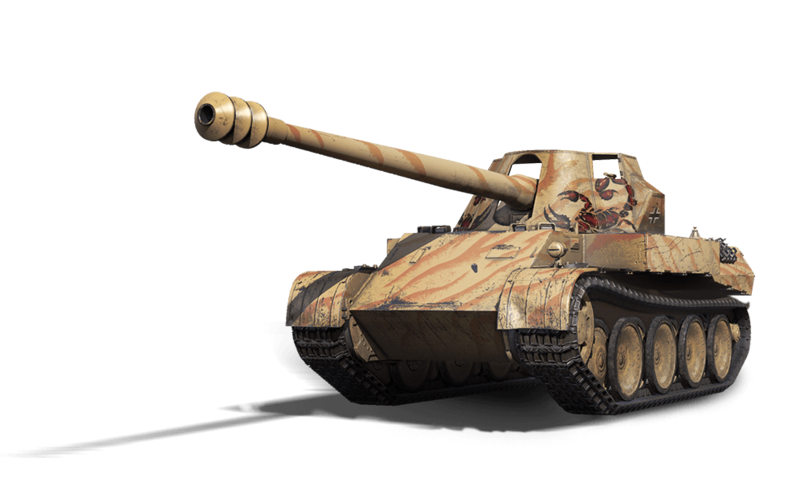 Today we are taking a closer look at the recently released German tank destroyer, the Rheinmetall Skorpion G. This Tier VIII Tank Destroyer is extremely dangerous when played properly, thanks to its outstanding mobility, accuracy and, above all, damage-per-shot values. Master it and your contribution to battle, as well as your credit earnings, will be extraordinary. An excellent gun: The Skorpion is armed with an outstanding weapon, as is typical of the German tree. An excellent accuracy of 0.3 and an aiming time of 2.1 seconds makes the gun really impressive. Great firepower: The vehicle strikes a good balance between its damage-per-shot value and its rate of fire. After firing, you will have just enough time to analyse the situation and decide what further actions to take. Mobility: This German Tank Destroyer boasts an impressive top speed of 60 kilometres per hour. Its acceleration is also not bad, so reaching key areas on the map, or relocating in general, shouldn't be a problem. A fully functional turret: After taking position, the Skorpion can stay immobile, as in order to aim it doesn’t need to make any additional hull manoeuvres – the gun is mounted on a special carriage and is fully rotatable. A unique appearance: The Skorpion is not only deadly for opponents, it also looks great, featuring a stylish, sandy camouflage that works on all three map types, as well as a unique emblem on the gun shield. The first thing you notice about the Rhm. Skorpion when taking a look at it is its close resemblance to the Panther tank. That is because the vehicle is based on the same chassis as the medium. However, this is where the similarities end. The Skorpion sheds any armour plating its progenitor might have had, including that of the turret, in favour of mobility and its dreaded 12.8 cm "stinger." When playing the Rheinmetall Skorpion, one needs to keep in mind the peculiar nature of its construction. This tank destroyer can be described as a textbook example of a "glass cannon": extremely dangerous when on the offensive, but fragile and easily broken when forced to fend for itself. That is why the first rule when using this vehicle is "keep away from the front lines" – your place is in the second or even third line. Use your gun's superb accuracy to your advantage and deliver heavy blows to enemy vehicles from a distance with each shot fired. Bushes and hills are your friends – hide behind them whenever possible to prevent enemy scouts from spotting you, then strike when they least expect it. In case your cover has been blown, put that great mobility to use and relocate immediately – your lack of armour makes you an easy target to dispatch, and you can rest assured that the enemy will do everything in their power to remove your gun from your team's arsenal as quickly as possible. Last but not least, choose carefully when to fire. If you're not careful, you risk revealing your position and/ or running out of shells too quickly. High caliber guns mean loud booms and limited ammo racks, so make every shot count. To sum up, the Skorpion is a Tank Destroyer that can perform different roles: providing active manoeuvring and fire support to allies on the offensive, or performing ambushes and sniping at longer range. The vehicle gives you the choice, but the decision is left to you. The missions included in the Ultimate and Supreme bundles can be completed only with the Rhm. Skorpion and will activate only after the first victory of the day bonus is used up.